Here is another freaky image to mess up your eyeballs. Stare at the black cross in the middle of the picture, keep focused 100% on it. 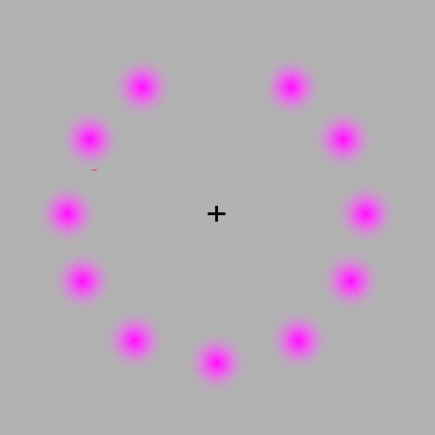 You should start to see the pink dots slowly disappearing, then they will turn green and even start to move around a bit. Results will vary between people, so if you struggle first time keep having a crack and eventually it should work. If you liked it don’t forget to share it with your buddies via the power of the internet! Want More? Find them in our dedicated optical illusions category, loads of good stuff. We hope you enjoyed this seriously uber awesome optical illusion, fire your comments below if you want to talk to the world. Oh my gosh this is so weird!